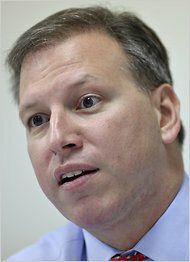 NY Times - Endorsement Sweep in the Comptroller’s Race | RabbiLevin.com - Fighting for Morality! In many statewide campaigns, a single newspaper’s endorsement generally does not make much of a difference. But Harry Wilson, the Republican candidate for comptroller, is hoping that a triumvirate of them can make more of an impression. Harry Wilson, the Republican candidate for comptroller. 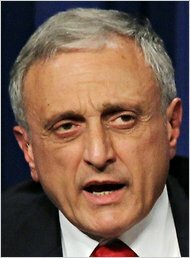 Carl P. Paladino, the Republican candidate for governor. In a new advertisement, Mr. Wilson, who has been trailing the incumbent comptroller, Thomas P. DiNapoli, left, in the polls, highlights the endorsements he picked up this weekend from the city’s three major newspapers — The New York Times, The Daily News and The New York Post. The advertisement is reminiscent of one that State Senator Eric T. Schneiderman, the Democratic nominee for attorney general, ran during the primary, when eight well-known Democrats read parts of an endorsement from a Times editorial. Mr. Schneiderman, of course, ended up winning. Mr. Wilson’s advertisement will begin appearing soon in New York City. It is notable because it is only 15 seconds long, or half the typical political advertisement’s length, and therefore costs half as much — a strategy that was employed by William C. Thompson Jr., in his bid to unseat Mayor Michael R. Bloomberg last year. But the advertisement could not come at a better time for Mr. Wilson, a former hedge fund manager, who is still largely unknown to most voters, according to recent surveys. When asked about the advertisement, the DiNapoli campaign did not address the endorsements directly. Instead, it released a statement reprising its criticisms of Mr. Wilson for failing to live up to his promise of releasing his tax returns. The political alliance between Carl P. Paladino and Rabbi Yehuda Levin lasted three days. But the aftershocks of their breakup seem to be rippling across the pond of New York politics. After that, the leader of the largest Orthodox group in the United States, the Orthodox Union, offered an apology to the archbishop of New York because Rabbi Levin had chosen the sidewalk in front of St. Patrick’s Cathedral to proclaim his disappointment with Mr. Paladino. Although the church says that discrimination against anyone is unacceptable, it has condemned the practice of homosexuality in harsh terms. Rabbi Tzvi Hersh Weinreb, executive vice president emeritus of the Orthodox Union, said he called the office of the archbishop, Timothy M. Dolan, to apologize not so much for what Rabbi Levin said, but for where he said it. “It’s a free country. You can say what you like. I just thought it was wrong for a clergyman to make a statement on the steps of another person’s faith,” Rabbi Weinreb said. A version of this article appeared in print on October 20, 2010, on page A27 of the New York edition. Interview With MSNBC "Last Word Show"